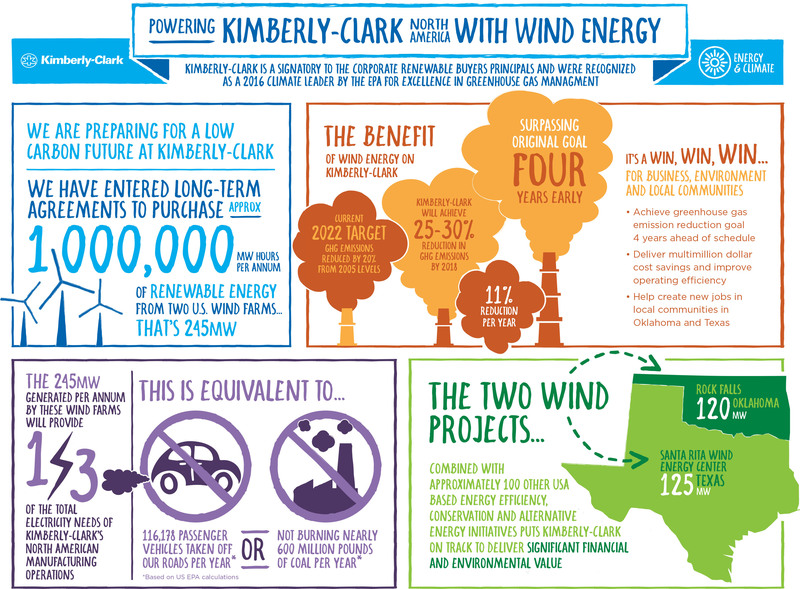 DALLAS, September 14, 2017 /3BL Media/ - Kimberly-Clark Corporation today announced its first major commitment to renewable energy with agreements to annually purchase approximately 1,000,000 megawatt hours (245 megawatts - MW) of electricity from two new wind power projects in Texas and Oklahoma. The renewable energy supplied by the wind farms is equivalent to about one-third of the electricity needs of Kimberly-Clark’s North American manufacturing operations and will enable the company to surpass its greenhouse gas (GHG) reduction goal four years earlier than anticipated. Six large-scale electricity cogeneration facilities with waste heat recovery, including a seventh project recentlyannounced and under construction at the company’s Mobile, Alabama manufacturing facility (due to start-up in 2019). The Rock Falls Wind project will become operational by the end of 2017, and the Santa Rita facility is expected to begin commercial operation by the second quarter of 2018. Renewable Choice Energy helped broker the two agreements. To support the growth of renewable energy sources, Kimberly-Clark has signed on to the Corporate Renewable Energy Buyers’ Principles, a collaboration of leading companies seeking simplified access to the renewable electricity to meet their clean and low carbon energy goals. “We used the Renewable Energy Buyers’ Principles when evaluating the business case for pursuing the offtake of utility-scale renewable energy with the EDF and Invenergy projects. Therefore, it was a natural but significant step for us to formally sign on and publicly endorse the Renewable Energy Buyers’ Principles,” said Stewart Van Horn, Director of Global Energy Solutions at Kimberly-Clark. The Buyers’ Principles tell utilities and other suppliers what industry-leading, multinational companies are looking for when buying renewable energy from the grid. The project is facilitated by World Resources Institute and World Wildlife Fund. For more information on Kimberly-Clark’s Sustainability 2022 strategy, including the energy and climate program, visit www.sustainability2022.com.